Helen Hoka Osiolo is faculty member and teaches Economics. Prior to joining Strathmore University, she worked as a Senior Policy Analyst at KIPPRA. 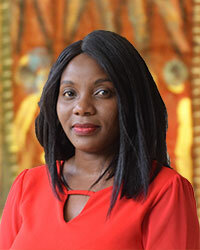 She has over eleven years’ experience in the analysis and modelling of infrastructure and environment with particular focus on the energy and transport sectors. Helen has a doctoral degree in Economics, her PhD Thesis was on ‘Indoor air pollution from household energy use in Kenya: analysis of the health outcomes and abatement efforts’. She is an author of several scientific journals and she is also a member of International Association for Energy Economics (IAEE). She has wide experience working with government, private sector and development partners. Helen Hoka Osiolo is faculty member and teaches Economics. – Special contribution to Transport and Infrastructure sectors, World Bank. Social Research Council (ESRC), UK. Osiolo, H., Sartori, N., and Colanton, L. (2019). Generating Energy Access: Empowering Africa, Access to Power in the African Continent. In Colantoni,L.,Montesano, G., and Sartori, N. (Eds. ), International Academic Publishers, Oxford, UK: Peter Lang. Willenbockel, Osiolo, H., and D., Bawakyillenuo, S. (2017). Exploring the Macroeconomic Impacts of Low Carbon Energy Transitions: A Simulation Analysis for Kenya and Ghana. IDS Bulletin, Vol 48, No. 5- 6: 49-78. Willenbockel, D., Osiolo, Helen H., and Bawakyillenuo, S. (2017). Macroeconomic Effects of a Low Carbon Electricity Transition in Kenya and Ghana: An Exploratory Dynamic General Equilibrium Analysis, Brighton: IDS. Osiolo, Helen H. (2016). Green Energy Benefits: Policy Options for Kenya. UNU-INRA Policy Brief No. 13, United Nations University Institute for Natural Resources in Africa. Osiolo, Helen H. (2016). Green Energy and Its Impact on Employment and Economic Growth. UNUINRA Working Paper, 19: VII – 36. United Nations University Institute for Natural Resources in Africa. Osiolo, H. (2016). Intergovernmental Fiscal Transfers and Fiscal Capacity, International Journal of Public Administration International Journal of Public Administration. ISSN: 0190-0692 (Print) 15324265 (Online). http://dx.doi.org/10.1080/01900692.2015.1094089. Pueyo, A., Osiolo, H., and Bawakyillenuo, S. (2016). Cost and Returns of Renewable Energy in Sub-Saharan Africa: A Comparison of Kenya and Ghana. IDS Evidence Report No. 190. Spratt, S., Pueyo, A., Osiolo, H., and Bawakyillenuo, S. (2016). From Growth to Green Growth Investments Diagnostics. IDS Evidence Report No. 472. Mutua, J., Ngui, Osiolo, H., D., Gachanja, J., Aligula, E. (2012). Consumer Satisfaction in the Energy Sector. Energy Policy, 48: 702-710 . Ngui, D., Osiolo, H., Mutua, J., Aligula, E. (2011). Household Price and Fuel Expenditure Elasticities in Kenya: A Linear Approximate Almost Ideal Demand System (LA-AIDS) Approach. Energy Policy, 39 (11), 7084-7094.